CellNOpt (from CellNetOptimizer; a.k.a. CNO) is a software used for creating logic-based models of signal transduction networks using different logic formalisms (Boolean, Fuzzy, or differential equations). 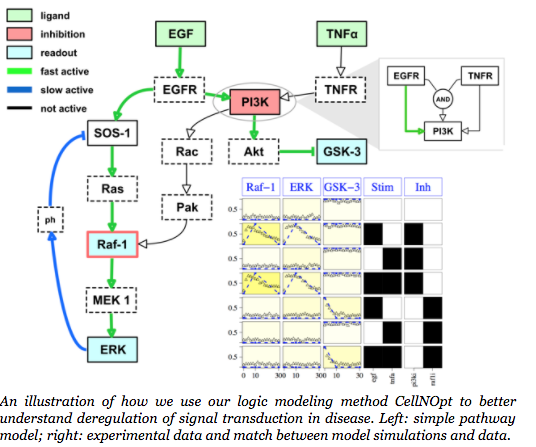 CellNOpt uses information on signaling pathways encoded as a Prior Knowledge Network, and trains it against high-throughput biochemical data to create cell-specific models. CellNOpt is freely available under GPL license in R and Matlab languages. It can be also accessed through a python wrapper, and a Cytoscape plugin called CytoCopter provides a graphical user interface. A series of packages are available in R. The core CellNOpt is available on BioConductor web site: CellNOptR, revision 1.4.0. Newest and oldest version are also available in our Downloads page. CellNOptR contains the core functions as well as the boolean and steady states version. It implements the workflow described in Saez-Rodriguez et al Mol Sys Bio 2009, with extended capabilities for multiple time points. CNORdt is an extension that allows to train a Boolean model agains time-courses of data. CNORfuzzy is an extension to CellNOptR that allows to handle continous values, using constrained fuzzy logic, as described in Morris et al Plos Comp Bio 2011. CNORode is an ODE add-on to CellNOptR. It is based on the method of (Wittmann et al BMC Sys Bio 2009), also implemented in the tool Odefy (Krusiek et al BMC Bioinf 2010). CNORfeeder is an add-on to CellNOptR that permits to extend a network derived from literature with links derived in a strictly data-driven way and supported by protein-protein interactions as described in (Eduati et al Bioinformatics 2012). 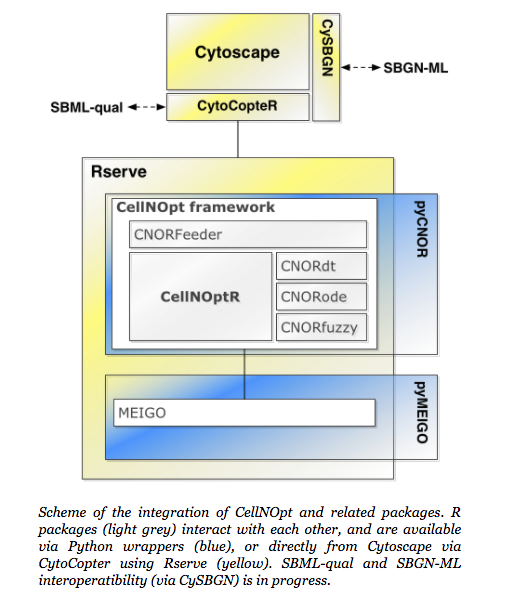 A Python package called cellnopt.wrapper provides a python interace to the R packages (CellNOptR, CNORode and CNORfuzzy). It uses rpy2 and is available on Pypi. For more details see the sphinx documentation in the ./doc directory after downloading the wrapper. In addition a pure Python version is developed on github. CytoCopteR is a Graphical User Interface designed as a Cytoscape plugin. It provides an interface to CellNOptR using Rserve. More information is available on CytoCopter page. MEIGO, a global optimization toolbox that includes a number of metaheuristic methods as well as a Bayesian inference method for parameter estimation, that can be applied to model training in CellNOpt. Available in R, Matlab, and Python. Presented in Egea et al BMC Bioinformatics, 214. The ColoMoTo consortium nvolves other groups developing tools and methods for logic modelling. We have also jointly develop the standard SBML-qual (Chaouiya et al, BMC Syst Bio 2013) (link) that allows to exchange models within tools. PHONEMeS Toolbox dedicated to mass spectrometry analysis. Some extra materials and courses about the formats used can be found in the CNODocs. Besides, the following link provides a tutorial given at In Silico Systems Biology, 2013. The following link provides also a CytoCopteR tutorial.